The Dengvaxia article that may finally pave the way for my "liquidation". The Dengvaxia article that may finally pave the way for my "liquidation". Here's one from a blogger who can't be bought. The #DengGate controversy centers on the Aquino Government’s botched anti-dengue mass vaccination program using global pharmaceutical giant Sanofi’s anti-dengue experimental vaccine Dengvaxia®. With P3.5 billion ($76 million) in illegally channeled public funds, the Philippines bought around 1,000,000 three-dose sets for use in a pilot batch of 1 million 9- to 10-year-old 4th Grade children in Central Luzon, CALABARZON, and the National Capital Region. Under the hastily launched program, over 500,000 of these children received their first dose the 2nd quarter of 2016. The government has so far injected over 700,000 children with the drug until it halted the program right after Sanofi admitted just days ago that the drug worsens dengue symptoms if administered to individuals who have never had dengue. In an apparent attempt to quell fears, Malacañang spokesperson Harry Roque said “there is no reason to panic”, arguing that “there will be nine out of ten who will be protected” from severe dengue. Another senior palace official, Health Secretary Francisco Duque, said the first Dengvaxia dose “provides a 30-month protection” from the disease. Assuming the unlikely event that Roque’s “nine out of ten” statistic has factual basis, asking the public not to panic solely on the basis that 90% of the vaccine recipients are protected directly negates Roque’s supposed reputation as a human rights lawyer. Does the protecting 90% justify endangering the remaining 10%? The government “inoculated” over 700,000 individuals, so the fact that Sanofi and the government endangered over 70,000 is “no reason to panic”? Besides, how sure is Roque that 90% have had dengue before, which is a requirement for the vaccine to work as designed? Where is the study? When was it published? Where was it published? Or did the government just made that number up to justify the botched mass vaccination program? To add further insult to injury, Roque, aside from being the presidential spokesman, is also the Presidential Adviser on Human Rights. What’s more disturbing, however, is the Department of Health’s claim that Dengvaxia provides “a 30-month protection” before the risk of contracting severe dengue kicks in. Under Duque’s “30-month protection” theory, all of the recipients under the assailed vaccination program must still be alive by today, because the program was launched only 20 months ago. 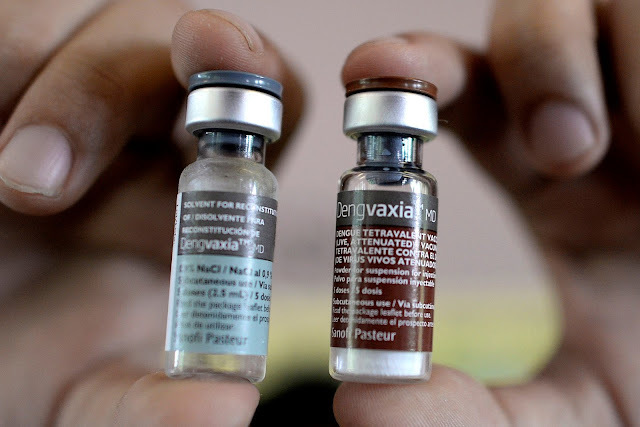 Civil society group Volunteers against Crime and Corruption (VACC) claims that at least three kids have died after receiving Dengvaxia as manufacturer Sanofi maintains that there have been no deaths due to the vaccine. In as early as program’s second week, however, a male recipient was pronounced dead on arrival at the Bataan General Hospital after suffering from cardiac arrest. Just two weeks after the death, authorities exculpated Dengvaxia by pinning the blame on congenital heart disease. Then-Health Secretary Janette Garin, who was the vaccine’s main government proponent and who headed its regulatory approval, ascertained the cause of death in no more than 14 days. Now, Dengue can trigger cardiac arrest [Vancini-Campanharo 2016]. It’s is linked to pulmonary edema [Lee 2012]. It also has symptoms similar to gastroenteritis [Varatharaj 2010], and it also causes dehydration [US CDC]. Is former Health Sec. Garin absolutely certain that it’s not dengue, or was she, along with the rest of her department, merely trying to cover up the mess? I have reason to believe that it is so, as Garin has an extensive history of ignoring multiple World Health Organization warnings against Dengvaxia, warnings that were issue way before, right before, and immediately after the launch of her catastrophic mass immunization program. If Garin indeed attempted a coverup, does it also mean that Health Sec. Duque’s “30-month protection” theory is just a figment of his imagination? Just hours ago, News5 reported that 10-year-old Bataan 4th grader Christine Mae de Guzman, one of the vaccine’s first recipients, died from severe dengue before receiving her second dose of Dengvaxia scheduled October this year. Christine had no prior history of the disease: this was her first dengue infection. Duque’s “30-month protection” theory would have meant that Christine would still be alive by now. But according to the death certificate, Christine died from severe dengue. Was Duque referring to some parallel universe that the rest of the planet has yet to discover? If so, then let us hope that we can refund the P3.5 billion we paid Sanofi so we can ship the 700,000 kids to the Bermuda Triangle and hope against all hopes that they will somehow end up there. So, should we attribute the “30-month protection” theory to malice, or is it merely a product of stupidity? Yesterday, I interviewed Lejani Pangalangan, a Tarlac mother who claimed that her daughter, Aimy Junnel Tamayo, contracted dengue. Aimy never had dengue prior to the first Dengvaxia dose. She received all three doses under the same mass immunization program where the late Christine got hers. Aimy’s last Dengvaxia shot was in August 2017, and the mother claims Aimy contracted dengue three months later on 28 November 2017. After the phone interview last night, the mother and I agreed to meet this afternoon. I told her that I will visit them in Tarlac so I can interview them personally. The mother was even glad that I’ll come to visit because I promised to help them with the bills after she told me that she even had to borrow money so she could bring Aimy to the hospital. The mother also said in the interview that the child was vaccinated without parental consent, although she doesn’t blame Aimy’s teachers for it because she believes that the teachers acted only upon orders from the Department of Health. I wrote a ThinkingPinoy article about that phone interview and it was published last night at 12:12 AM. The article quickly went viral and it has garnered over 16,000 shares as of this article’s writing. A few hours later at 7:12 AM, the mother Lejani tried to call me but the signal on my phone was poor. I have a morning radio program, “Karambola sa DWIZ”, so I was inside a building at time, preparing for the show. I texted Lejani, asking why she tried to call. That was odd. Leijani said she discovered about the immunization only after Aimy’s younger sister complained about why she wasn’t given Denvaxia too. If Leijani indeed signed a consent form, how would she totally forget about it? JUST A FEW HOURS LATER AND SHE’S BACKTRACKING ALREADY!? I felt that Leijani was lying about the consent form, but I still gave her the benefit of the doubt. Despite my reservations, I immediately updated the article to reflect this development and I informed her about it about it right away. Should there be problems, I was intent on defending Aimy’s teachers, even if it has to be in front of Education Secretary Leonor Briones: I would’ve done so even if no one asked for it. I am a firm believer that they deserve to be shown more compassion than most people.Despite the assurance, the mother repeatedly insisted that I take down the article, but it takes more than a couple of text messages for me to do that. Leijani sent one text after another, with each subsequent message sounding more and more panicky. After the radio show ended, I immediately and repeatedly tried to call her after the radio show but her phone cannot be reached. I started to worry, as there are wide range of things that could have gone wrong with the child. Leijani told me the night before Aimy’s platelet count was low at 38 and may still be falling. From my best recollection, I think I managed to call her at around 11:30 AM as I was on the way to Tarlac, I confirmed with her that we will meet between 2 and 3 PM as previously agreed upon. I texted her again at 12:50 PM, asking her if she was alright. I arrived at the hospital at exactly 2:19 PM, in line with our agreement. Right before I entered the lobby, a hospital staffer recognized me and asked for a photo. The hospital staffer said he is one of my social media followers so he was already aware of what Leijani and I agreed upon. He told me that Aimy and Leijani have already been transferred to another hospital. I was shocked. I told him I needed more details, so he introduced me to another hospital staffer who witnessed the hospital discharge. Note that I will never reveal their identity, for their own protection. The second staffer told me the following that doctors from the Department of Health – Tarlac arrived at hospital around 9:00 AM. The doctors spoke to Leijani over breakfast at the hospital cafeteria. He said the doctors paid for all the expenses Leijani has so far incurred and told the hospital that they will facilitate the patient’s discharge for transfer to Jose B. Lingad Hospital in the neighboring province of San Fernando, Pampanga. Do provincial DoH offices have discretionary funds that can be used to “bail out” patients from private hospitals? If so, why just Aimy? Some of Aimy’s neighbors also got struck with dengue and are in the same hospital, so why did DoH Tarlac take Amy and no one else? The hospital staffers said all the hospital employees who witnessed the scene were all surprised. Concerned about mother and child, a hospital employee even asked Leijani if she will have a place to stay in Pampanga. According to the staffer, one of the DoH doctors said they’ll give Leijani a room. One of the staffers told me that it was highly irregular and perplexing. He said there’s a dengue epidemic in Leijani’s village and some of the other dengue victims are admitted in the same hospital. He wondered why DoH-Tarlac took Leijani and Aimy and left everyone else behind. He said they left at 12 noon in a vehicle with DoH-JBL decals (branding). I respectfully declined the offer on humanitarian grounds. The teacher’s platelet count is low so I do not want to subject her to further stress anymore. For all I know, she might start hemorrhaging just by trying to talk. Asked for the names of the DoH doctors, the staffers said they can’t recall the exact names anymore, but one of them said one of the doctors had a surname of “Santos”. I thanked the hospital staffers, quickly exited the building, did a quick 5-minute Facebook live session as proof that I really went there, then immediately left Tarlac. Tarlac, after all, is the home of former President Benigno Aquino, one of the masterminds of the Dengvaxia Scandal. I tried to call Leijani again as soon as we got onto the Subic-Clark-Tarlac Expressway, but no one was answering. For some really weird reason, Leijani, the Dengvaxia victim’s mother, doesn’t want to talk to me anymore. I immediately called my friend Sass Rogando Sasot at around 3:35 PM and I told her about what happened. She asked for Leijani’s number and she said she’ll call Leijani herself. The rest of the this section is based on how Sass recounted the events to me. Sass dialed Leijani’s number but it was busy. She dialed it again and it rang. Leijani picked it up. Leijani and her friends were trying to solicit financial help for Amy online since last night. Thus, Leijani shouldn’t be surprised if she gets calls from total strangers, in the same way that she wasn’t surprised when I called her last night. Sass heard somebody talk to Leijani and just moments later, Leijani hung up. Available data suggests that DoH Tarlac took just Leijani and her daughter Aimy. They left Tarlac for Pampanga at 12 noon and the call took place at around 3:35 PM so Leijani’s relatives, if any, are unlikely to be there that fast. Who was coaching Leijani, a Health Department employee? Leijani suddenly “came back to life” when she texted me again at 7:33 PM and apologized for not informing me about their transfer. She said she was already groggy out of hunger and exhaustion. She said somebody told her about the Facebook live session I did in the hospital in Tarlac. She admitted that DoH Tarlac offered help and she accepted and that there was no money involved. She said she wasn’t silenced in exchange for money, and all that she wants is a quiet life and what’s best for her daughter. I can’t take her word for it anymore because I have reason to believe that her texts were sent under duress. No, she’s in probably in no physical danger, but as a mother, I think she feels the necessity to comply with whoever is necessary, for the sake of her daughter. #DengGate has been raging for almost a week now, but we have yet to hear from a President who’s typically vocal even about the littlest of issues. If Duterte knew about #DengGate, would he be in Greenbelt yesterday to shop as the parents of hundreds of thousands of Filipinos lose sleep over the Dengvaxia scandal? That’s not Duterte, so somebody may be keeping the issue away from his eyes… and his daily briefings. I think there’s a coverup going on, from a little bit below the top all the way to a little bit above the bottom. After all, many of them may be complicit to this whole mess, and many of those heads will roll if somebody opens the can of worms. The relative silence of government authorities, the mismatching official statements, the disappointingly scant media coverage of what would otherwise be a major national issue… all of these point to a concerted effort to play down #DengGate. All these, in my opinion, point to a massive coverup. And who are the suspects? Read the title, for starters. [ThinkingPinoy].